The Grand Harpsicle® Harp is found in the hands and performances of harp professionals around the world because it fills an unusual niche. The Grand, as we call it, is light enough to easily be worn on a strap so a performance is not tied to a single spot while still offering a 33-string range and a voice which is lovely both with or without the built-in pickup in use. Pros are taking the Grand out into their audiences as well as using it in intimate or even therapy environments. 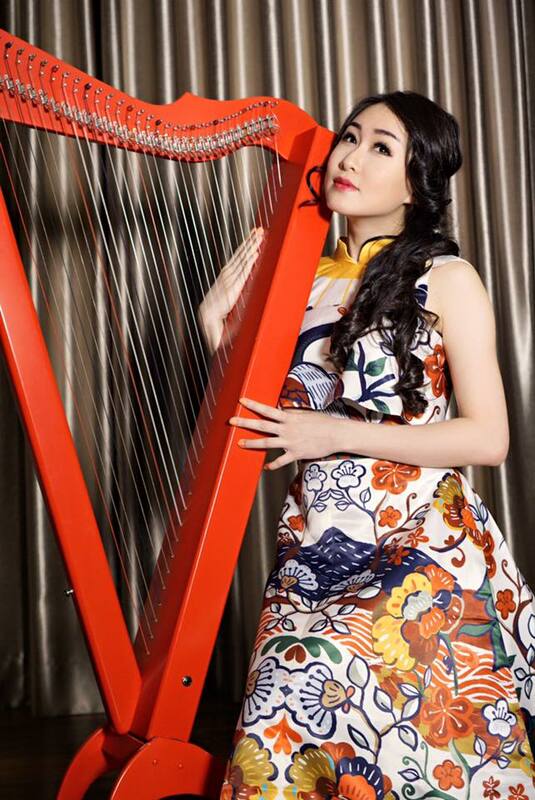 Professional harpists, who so often are working with much larger and much more expensive instruments, find the Grand to be big enough without all the accompanying stress and logistics of their larger harps. And they are having fun while they are at it! 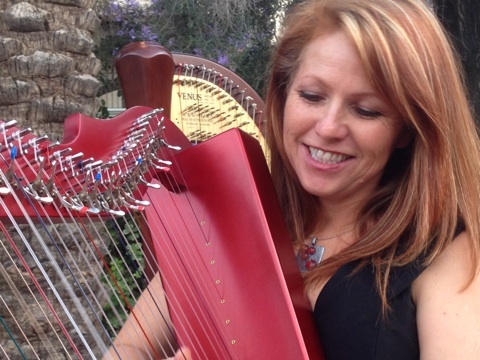 The Grand is a full-range harp but weighs no more than an electric guitar. It can be played as a floor harp or removed from the detachable stand and strapped on with a guitar strap for maximum mobility. The Grand is equipped with a professional electric pickup system and a built-in preamp with volume control. Simply use any quarter-inch jack cable to plug the harp into your desired amplification or recording equipment. 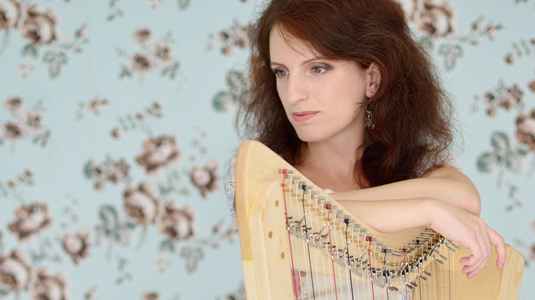 Our customers love using this harp in all kinds of venues, from beach weddings to jazz concerts. Irish sessions to New Age retreats, and even in metal bands! 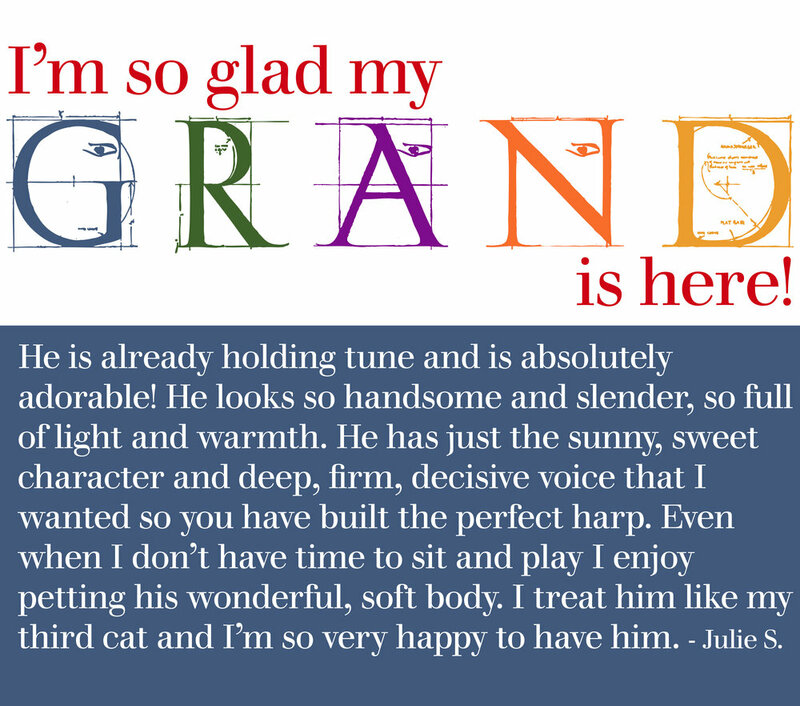 The portability, flexibility and range of the Grand also make it an excellent therapy harp. With a Grand Harpsicle® Harp as your companion you are finally free to open the doors to a whole world of music and to play your harp out! Available in natural maple, and our new stain colors walnut stain, cherry stain, black, white, red, orange, yellow, green, blue, purple and pink. All Grand Harpsicle® Harps come with full Rees sharping levers, wrapped strings in the lower range, installed pickup and preamp, detachable stand, string chart and tuning wrench. Well, you came this far. Take a look at the top of the line. It's Brilliant! There are so many great accessories for the Grand Harpsicle® Harp it's hard to know where to begin. The one which has been in development the longest is definitely the new, heavy-duty Grand Standing Stand. (I smile every time I say that.) Lots of folks told us they wanted to stand and play the Grand but they did not want to wear it strapped to their bodies. Let me tell you, that is a more difficult problem to solve than it seems. The biggest issue is that the shape of the harp and gravity are, perhaps, not the easiest combination. In prototypes it was common to have a Grand tip backward. So annoying! Eventually, we struck the right balance, literally, and then had to solve the other stability problem: when the harp was being played, the stand tended to wobble. Sigh! Finally, after many, many different designs, Garen hit the sweet spot and we have our new, you guessed it, Grand Standing Stand! The Grand does come with a pro-quality pickup and preamp so it makes sense to get serious about amplification accessories. Not all amps are equal when it comes to amplifying harps. Amps are generally built to optimize the range and tone of guitars, basses or pianos. There are amps optimized for acoustic instruments as well but when amp manufacturers say "acoustic" they mean the guitar family. Harps end up being the odd instrument out. For us this means that we listen to a LOT of amps. In 2018 we found two new, terrific amps to add to our selection. Both of these are battery-powered and both are truly exceptional. The ZT Lunchbox Junior is a 5 lb (2.27 kg) wonder and the Fishman Loudbox Mini Charge combines both fabulous voicing and long-lived charge. For buskers and gigging pros, either of these two amps is a real step up. To see all our recommended amplifiers click here. We keep talking about this next accessory over and over again and that is a reflection of how important we think it is. If the cable between your harp and your amp is the standard, low definition cable you have been using forever then too much gets lost between your harp and your audience. Asterope High-Definition Cables are the solution. There is literally no accessory a pro can own which will make a bigger difference than Asterope. We have beautifully crafted, custom, American-made padded bags for the Grand and you can find them by clicking here. The Grand Standing Stand for the Grand Harpsicle® Harp elevates the harp so you can play standing up, making it easier to be played, displayed, and to stand on it's own for your performances. This incredibly sturdy Grand Standing Stand pivots the Grand Harpsicle® Harp to different angles and adjusts to different heights for a perfect fit. 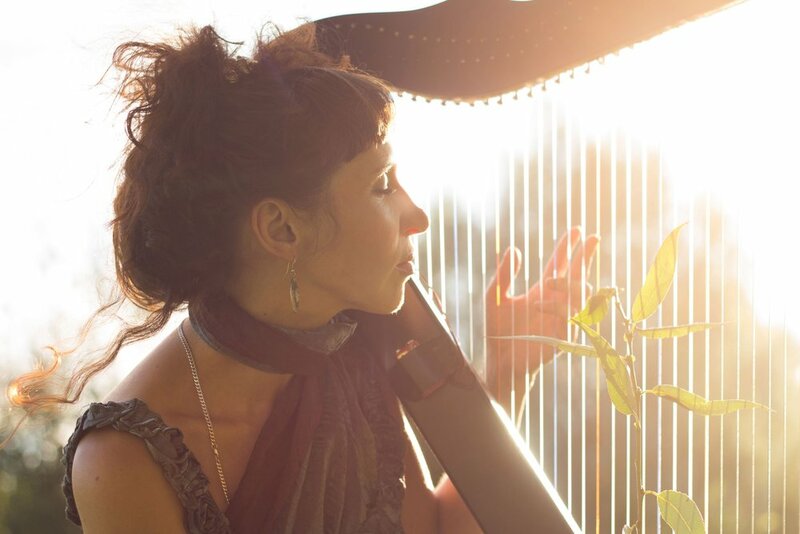 The bottom of your harp can be elevate from 23" to 33" off the floor. Only available in natural wood with metal legs. This works with the Grand Harpsicle® Harp only. This stand does not work with the 26 string Harpsicle® Harp, Sharpsicle™ Harp, Flatsicle™ Harp, Fullsicle™ Harp or Special Edition. To play your 26 string Harpsicle® Harp standing, choose the Harpsicle® Standing Stand. This is the Spider Theme from the original work for a celtic harp, Cauldron Dance, by Belarus composer and performer Ivan Solas. Ivan works with the Lumiere Tales project and if you do not already subscribe to their YouTube feed, do it now. It is not to be missed!